The LightSheer laser is the top of the line laser system in hair removal. It is the most effective and safest laser hair removal system on the market. It is the least painful and requires the least amount of treatments to obtain desired results. 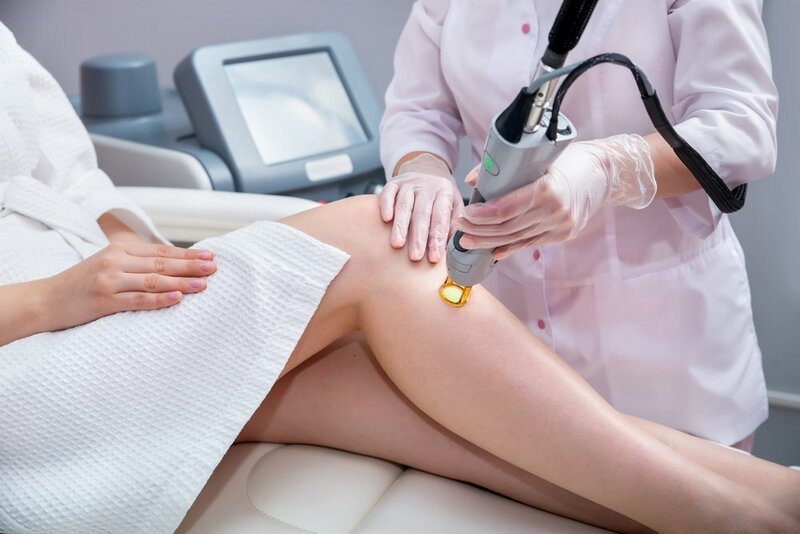 The Lightsheer laser for hair removal is recognized as the “gold standard”. The diode laser was specifically designed for effective laser hair removal and its patented chilltip technology provides continuous contact cooling of the epidermis for maximal patient safety and comfort. The Lightsheer is best for laser hair removal of light to moderately pigmented skin. Popular treatment areas include the legs, underarms, the bikini area, the upper lip, arms, chin, back and shoulders. 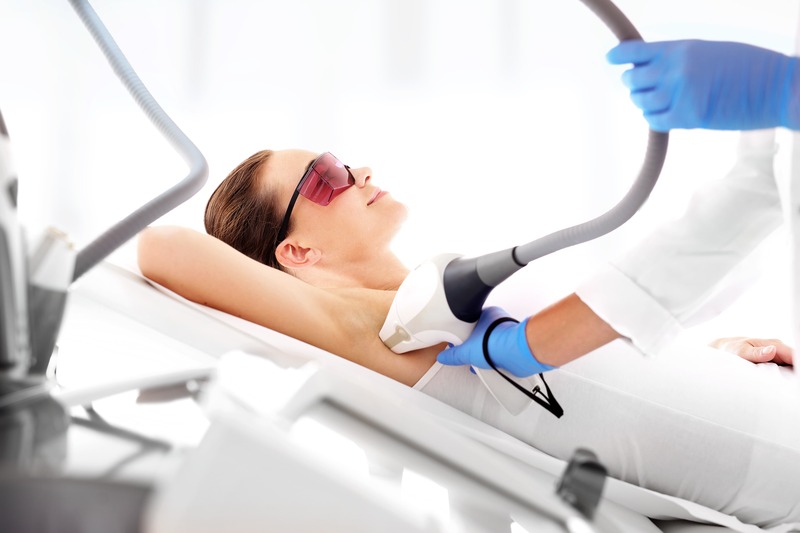 Laser hair removal is the most effective in areas where hair is dark and coarse. The number of laser hair removal treatments varies based on your ethnic background or skin type as well as the treatment area. During the procedure, the light emitted by the LightSheer diode laser is absorbed by the pigment present in hair follicles. The laser will pulse for a fraction of a second, long enough to heat up the hair, and impede the the follicle’s ability to regrow. The process also treats numerous hair follicles at the same time. As a result, LightSheer has the ability to quickly and effectively treat even the largest areas of the body. Depending on the size of the area being treated, a laser treatment procedure may take anywhere from a few minutes to over an hour. The laser treatment may cause some discomfort in patients who are sensitive to pain. Many tolerate the procedure well, but in sensitive areas of the body, topical anesthesia can be an option. For the safest, more effective treatment, it is best if the treated area is not suntanned. Wear a broad-spectrum sunscreen of SPF 30 or higher and cover the treatment area with clothing when outdoors. Forpatients who participate in outdoor or water spots, the sunscreen must be water resistent. If you do have a tan from sun exposure or from sunless tanning products, please postpone your laser hair removal treatment until the tan fades completely. Please refrain from waxing, tweezing, threading, or having electrolysis for at least 6 weeks prior to your first fession. Having hair present in the treatment area is essential to a successful procedure. The best way to manage hair before you begin laser hair removal is to trim or shave. For at least five days before and after each laser session, do not use any skin care products which have ingredients that can irritate the skin. This includes acids (AHA, BHA, L-ascorbic acid), depilatory creams, alcohol, retinol, hydroquinone, retinoids, etc. If not sure – please consult your physician at The Centre for Dermatology. Laser hair removal removes unwanted hair permanently by targeting and damaging the root of the hair. The laser itself is attracted to pigment or colour. When there is a good contrast between the colour of the skin and the hair, the laser damages the root and leaves behind a small stem. Over the next 2-3 weeks after treatment, it will appear as if the hair is growing back. In actuality, the skin is naturally pushing this stem up and out. If you were to pull at these hairs with your fingers (not tweezers) 2-3 weeks after the treatment, you will notice that these hairs will slide out easily and with no resistance at all. Once these hairs fall out, there will be a period where there is very little hair present on the skin until the next hair growth cycle, when another treatment will be needed. For 48 hours after your treatment, the treated area of your skin will look and feel like it’s sunburned. A cream to soothe the skin (ie: Aloe Vera gel) can be used, and the treatment area can be cleaned with a mild soap as advised by a member of The Centre for Dermatology team. Avoid any additional heat to the area, exercise, sauna, hot yoga, hot tub and other activities which may irritate the area or induce heat. If you notice that the treated area feels hot, apply an ice pack wrapped in a paper towel (or another barrier). Do not apply ice directly to the skin. Over the next several weeks, the hair from the treated area will fall out. It is important to wear a broad-spectrum sunscreen of SPF 30 or more to prevent temporary changes in the colour of the treated skin. In rare instances, blisters may occur. This is more likely to occur in people who have darker complexions. Other potential side effects include swelling, redness, and scarring. Permanent scarring or changes in skin color are rare. If any side effects are experienced, they are minor. This includes redness and slight swelling around the treated hair follicles, which actually indicates that the follicle has responded to the treatment. Many of our patients at The Centre For Dermatology are quickly able to return to their normal activities right away. If you would like to learn more about your treatment, possible side effects, and the results you will receive, a member of The Centre For Dermatology will be happy to speak with you during a consultation. For most patients, 8 to 10 treatments are required to get the best results. You would require more than one treatment because of the different cycles of hair growth, which occur approximately every 6 to 8 weeks for hair on the body and for 4 to 6 weeks for hair on the face. It is most ideal to treat the hair during the most active stage of hair growth, which is when the hair follicle has a full root.